While many businesses might close up shop for the holidays, there's still plenty of things to do over the week of Thanksgiving in New Orleans. Whether you're in town visiting family or happen to be in New Orleans for work, you're sure to find something to put you in the spirit of giving thanks this year. On your trip to New Orleans this November, you can expect mild and sunny weather and holiday activities including everything from horse racing to watching a classic football rivalry on Saturday afternoon as well great places to eat and even a spectacular light show to start of the Christmas season. The day after Thanksgiving is the day to shop, and New Orleans' famous Magazine Street has over six miles of locally-owned boutiques and antique stores offering the perfect place to find just right the gifts for everyone on your holiday shopping list. Afterward, you can enjoy the Celebration in the Oaks, an annual event that kicks off every year on the day after Thanksgiving and lasts until January 2. 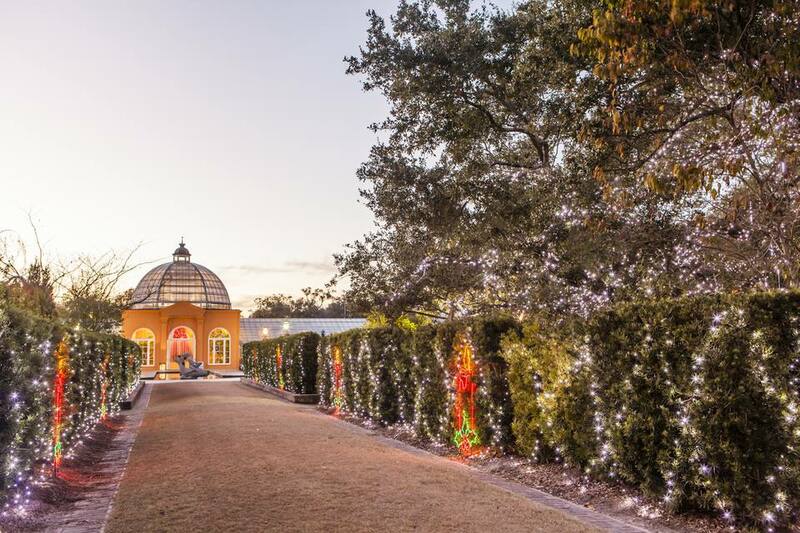 It's billed as one of the most spectacular holiday lights festivals in the country, drawing thousands of visitors every year; this not-to-be-missed event takes place in New Orleans' City Park, one of the oldest urban parks in the country. One of the highlights leading up to the big game is the competition between the two schools' marching bands in a "Battle of the Bands" held in the Superdome the night before the game. This classic competition can get just as heated as the main football game and usually takes place in front of a stadium full of fans. With four nights of parties in celebration of this old-school rivalry, there's no shortage of things you could do in New Orleans during this festive holiday week. Food is one of the greatest reasons to visit New Orleans, so if you're looking for a great meal with all the trimmings on Thanksgiving Day, let one of the Big Easy's chefs fix a sumptuous feast for you and your family. From great traditional Thanksgiving brunches that feature classic jazz bands to the city's famous Creole cuisine, New Orleans' famous eateries satisfy every palate. Arnaud's is one New Orleans venue that offers classic French Creole dining on Thanksgiving Day in a historic setting. Enjoy traditional Thanksgiving fare with a distinctly New Orleans twist, like fresh Gulf shrimp in Creole remoulade sauce and turkey with oyster dressing served in Arnaud's beautiful 19th-century dining room. If you're in New Orleans on the Saturday before Thanksgiving, don't miss the annual opening day at the Fair Grounds Race Course, which marks the start of the horse racing season. You can also catch a thoroughbred race on Thanksgiving Day or over the following weekend, and the facility offers slots, video poker, and cash giveaways. The racetrack originally opened in 1852 as the Union Race Course but closed briefly in 1857. In 1859, it reopened as the Creole Race Course but was sacked by Union troops during the Civil War. Nevertheless, horse racing continued there to this day, so you can enjoy the sport of kings at this historic track—just don't forget to wear an awesome hat! On Saturday of Thanksgiving weekend, the Southern University Jaguars and the Grambling State Tigers meet in one of the greatest rivalries in college football, the Bayou Classic, which takes place at the Mercedes-Benz Superdome. You can join the crowds at this classic game and cheer on the team of your choice for some hard-hitting football on Thanksgiving weekend. This nationally televised game brings the faithful of both teams to New Orleans, and the celebration starts out with a huge Thanksgiving parade from the Superdome to the French Market, including brass bands from around the country.